The new series of turntable tyre changers has been designed to meet any kind of demand from the workshops. The extreme rigidity of the structure and the reduction of flexion of the operating arms, make them a market benchmark for robustness and solidity even with UHP and RFT tyres. All models are approved by WDK and supplied with a complete scope of delivery. MS 630-24 and 650 are pneumatic tilting back pole passenger car tyre changers that allow to work with car, light commercial vehicle and motorcycle tyres (with special accessories). The 630-24 model is equipped with 24” turntable (external clamping), while 650 is equipped with 28’’ turntable. Both models can be provided with standard bead breaker Ergo Control function. Motor Inverter drive system guarantees the best combination of power and speed needed for an effective service.The MS 650 is supplied as standard with a pneumatic positioning of the mounting tool and the Technoroller NG that makes easier and faster the work with UHP and RFT tyres. 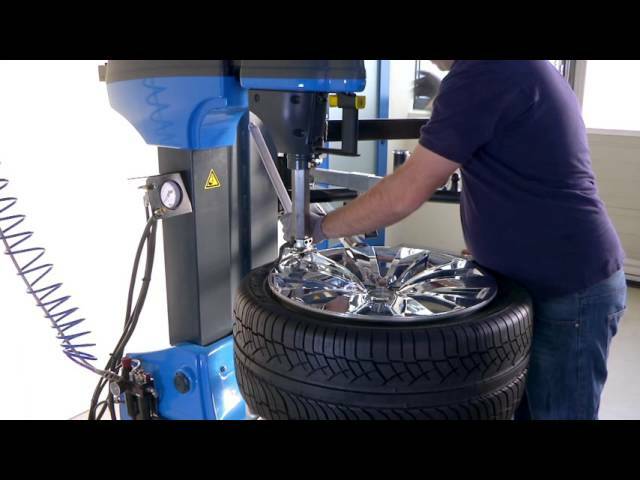 MS 500 and MS 530 are pneumatic tilting back pole passenger car tyre changers. MS 500 is equipped with a 20” (external clamping) round turntable single speed while MS 530 is equipped with a 22” turntable double speed; both are provided with pneumatic locking of mounting head and pneumatic bead breaker. Especially designed for medium volume workshops, MS 500 and MS 530 are the right equipment to work with performance without sacrificing comfort. The MS 43 swing-arm tyre changer is our starter appliance for professional tyre and wheel work. With 20" clamping capacity (external) it‘s easy to use, makes efficient use of technology, and also gives a top rate price-performance ratio. It comes with maximum quality and service too.